The hairstyle is an important part of your makeover or getup. A hairstyle can be your fashion statement if you can carry it properly. These days even men are conscious about their hairstyle. Then there is every reason for a woman to be conscious of her hairstyle. A hairstyle must always be chosen according to your hair type, texture, and your face cut. Of course, the most important thing which matters is whether you will be able to carry it or not. Even a gorgeous hairstyle will ruin your complete getup if you are unable to carry it off. A proper hairstyle can do wonders for your look. It can make your thin hair look voluminous; it can make you look younger. Sometimes different hairstyles are also done to hide any flaws on the face. On the other hand, if the hairstyle is not chosen properly, it can also make you look older than your actual age. Therefore, before selecting a hairstyle you must be very sure about the look which you are hoping to get and whether it will suit you or not. Layers are so much in fashion these days. Given below is a list of Medium Hairstyles with Layers for you to choose from. If you have shoulder length hair, then this is the perfect style for your haircut. The best thing is that this hairstyle suits almost any age. The light waves and the messy look create the perfect casual getup you have always desired. The medium wavy layered hairstyle can be easily carried if you have wavy hair. If you have straight hair, the hairstyle looks neat. For a more casual look, you can also create light waves in your hair. If you do not like bob cut hair in short length, then the medium layered bob is perfect for you. The length of the hair is up to the shoulder. The bob cut in layers looks stylish and trendy. If you have a broad forehead, it is the best hairstyle to balance the look. The medium layered bob can be best carried if you have an oval or long face. You can easily carry this look with any dress. The layered look in the medium blonde layered hair looks prominent with the front layers falling on the face. This look is perfect for those who have a straight hair and volume to the hair. The layered look of the hairstyle creates a soft style which complements any face shape. People having fine hair can go for this hairstyle to carry with an elegant outfit. This layered cut creates the perfect funky look for your hair. 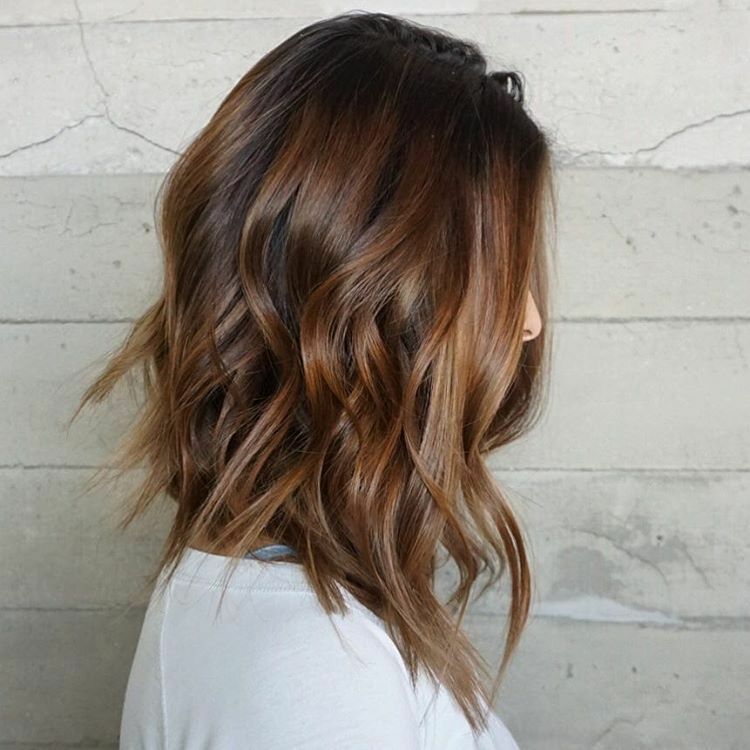 The brown balayage haircut style is uneven with short hair on the back and longer ones in the front. The uneven style looks very classy and elegant at the same time. The hair on the outer sides with a brown highlight completes the look. This hairstyle is best suited if you have wavy hair with the waves originating at the end of your hair. The layers in this hairstyle have been perfectly styled to create an elegant classy look. The hair strands have been perfectly styled to create a back swept style of the layers. This hairstyle for mid length hair makes the hair more voluminous and thicker. The ends of the layers have also been slightly curled to avoid the tapered look. For people with straight blonde hair, here is the perfect hairstyle for you. You can easily carry this look with an elegant dress. The hairstyle does not have prominent layers but the focus is on the texture of the hair. The layers have been carefully done which is carefully straightened with the rest of the hair. The front layers have been let loose on the face which creates the elegant look of the hairstyle. You can wear this hairstyle at a social event or a gala. If you have medium-long length hair, you can try this hairstyle to complement with your formal wear. In this hairstyle, the entire focus is on the layers. The layers specifically have been waved and curled to create a slightly messy yet classy look. The hair along with the layers has been let loose in the front whereas in the back the layers have been made prominent. Such a hairstyle renders a fuller look to your hair. If you have thin hair, you can definitely give a try to this haircut. The side swept wavy layered hair is just another variation of how you can carry your layered hair. If you are bored with the same simple look, you can try this one. Layered hair looks very stylish if you create waves in your hair. You can apply some gel and lacquer to the layers and create the perfect style for your hair. The side swept hair with this look will go with an elegant dress for your party or any other event show. 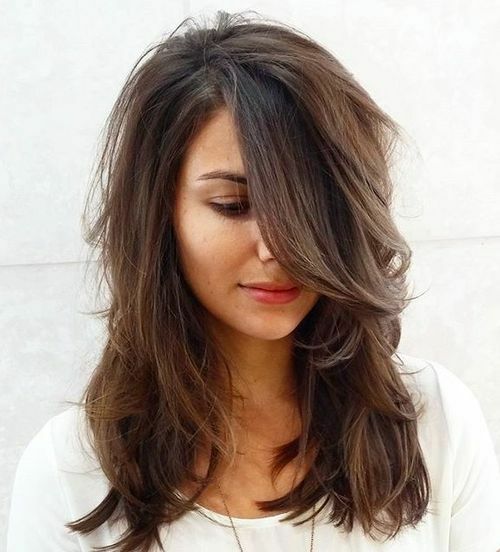 If you have medium length hair cut in layers and are bored with the same style, this look will instantly change your look within seconds. The bangs in the front transform you entirely. If you have thin hair, your look becomes stylish with this hairstyle. The layered cut is done up to the shoulders and the bangs falling on the forehead create the chic look which you can pull off easily. You can carry off this look with any dress. The hairstyle is best suited if you have a hair length ending just below your chin. To get the look, you have to create a perfect messy look of your hair. Highlights at the hair end give your entire look a classy transformation. Most of the hair is swept to one side over the top of the head and the rest is kept as it is to create the perfect look. The Ombre lob style is perfect for you if you want to carry off medium short hairstyle perfectly. For all those blonde girls out there, this look can bring out the charm in you. If you have hair that reaches just above your shoulder with blonde highlights, this hairstyle is perfect for you. The layered ends are frizzy which creates the perfect classy look. The messy tresses are perfect to carry off with a casual outfit. If you have thin and wavy hair, this hairstyle will suit you best. Who said that layers only look good on straight hair? You can have the perfect look even if you have curly hair. The layered curls look very stylish and trendy for a casual outfit. If you do not have much volume in your hair, the layered cutting in your curls will give you a voluminous and fuller look. You can carry off this haircut with a casual outfit. This haircut is suitable for any face shape. Having a bob cut hair is not always boring. You can still rock your bob cut hair look with this hairstyle. Or you can also make your regular hair look like this one. The hair is simply parted and the ends are styled up towards the ends. The layers of the hair make this styling look classier and elegant. You can carry off this elegant look with any formal wear. Here the ends of the layers of the hair are made to look wavy. The medium blonde curly layered hair is perfect for those having blonde hair with light curls. The light curls render a soft look to the style. You can easily carry off this hairstyle with an elegant dress for an event. The soft curls are nicely done up to accentuate the face. For a little bit of messy look, few strands have also been left open in front of the forehead. You can get a casual yet elegant look with the hairstyle. You can give your layered haircut a more stylish look with this hairstyle. The hair has been kept loose which reach till the shoulders. The bangs in the front add more style to this look. The layering ends of the hair are made to look prominent. The slight wavy hair looks classy and casual at the same time. You can pull off this hairstyle with a casual outfit or with a semi-formal outfit. The balayage medium layered hairstyle is the right hairstyle for you if you have shoulder length hair. Soft waves have been created at the ends of the hair to give a classy look to your hair. The highlighted strands mixed with the tresses add a casual look to your getup. This top of the head has been left casual whereas the ends of the hair and side tresses have been given a wavy look. You can wear this look with any trendy outfit you have. If you have straight hair, this layered look would be perfect to complement your outfit. The hair has been left open with slight waves at the end. The hair length is below the shoulders which put the focus on the layers. The straight look of the hair will look elegant and smart with any outfit. The hair has been side-parted and the hair is left casually open. The hair has been carefully parted in the middle. After that, the ends of the hair have been given soft waves. Long layers have been done to shift focus from the haircut to the hairstyle. This simple messy looks chic and classy with any formal outfit you have. The hair ends have also been highlighted. If you have less volume in your hair, you can try this hairstyle for the perfect look. The sleek layered hairstyle is perfect for those who have shoulder length silky hair. Without any special makeover, you can easily carry off this simple hairstyle. The hair has been left open with a simple side parting. The straight and sleek look attracts focus towards the carefully cut layers in the hair. For this look, you have to have an ultra shiny and smooth textured hair. The sleek look is what gives a prominent view of the layer cut of the hair. This is the classic bob cut with a trendy look. Layers in the front create a perfect frame for your face. This hairstyle is best suited if you have a round face. In that case, this style perfectly highlights your face cutting. The layers have been carefully done from the top until the end of the hair. Few strands have been left open in the forehead to give a trendy look. In this hairstyle, the bob cut look has been given an entirely different look. The shoulder-length hair has been given a wavy look. There are bangs in the front. But instead of letting them loose, the bangs have been curled which creates an elegant timeless look to the face. The hair has been side parted with the bangs grabbing attention on the face. This hairstyle is best suited if you have thin hair without much volume. This hairstyle is just the right one for you if your hair length is a little below your shoulder. The entire hairs with layers have been given a wavy look. The ends of the layers have been kept as it is whereas rest of the hair is wavy. The bangs in the front have been left open with slight curl inwards. Instead of prominent look, the blunt bangs look even classier with this hairstyle. This hairstyle will look chic and stylish if you have thin blonde hair. To shift focus from the texture of the hair and make it look trendy, the ends of the layers have been given a tapered look. There is no prominent hair parting which creates a casual look. But the layers with soft waves at the end add elegance to your hairstyle. This hairstyle can be pulled off with any trendy outfit. The hairstyle is what actually creates the retro look. The hair length has been kept right up to the shoulders. The layers have been kept long and waved at the hair ends. The entire sleek hair with a casual side parting and wavy layers create the perfect retro look with elegance. You can team this look with a complimentary outfit. The choppy lob is the perfect hairstyle for you if you have hair length medium short ending just below your chin. In this look, the entire hair has been side swept to make the uneven layers look prominent. This hairstyle is suitable to carry off with a formal outfit. This casual yet chic look is perfect for those having an oval-shaped face cut. The choppy shag haircut looks casual yet chic. The hair has been left open casually. The uneven layers look prominent in the straight blonde hair. Instead of gelled into place, this frizzy look creates a more casual look. You can carry off this haircut with any casual or formal outfit as well. The middle parting in the hair renders a clean look to the hairstyle. This haircut is perfect to carry off with a casual dress. In this haircut, the layers have been kept messy to avoid focus. The main focus is on the front bangs which are left in a disarray over the forehead. These messy bangs give a ruffled look on the front side of the hair and also frames your face cut. The medium bob with bouncy layers is the hairstyle if you have a round shaped face. The hair has been parted in the middle. The layers have been given soft waves which create the bouncy look. The hair ends have been left open with the cut end of the layers looking prominent. The entire hair has been given a light wave to look fuller and voluminous. This hairstyle is right for those having hair length reaching right above the shoulders. The hairstyle has a casual yet classy look to it. The hair stands have been kept disarrayed and left open. The hairstyle has a bit shorter look on the back than the front. The layers complete the casual look of the hairstyle.